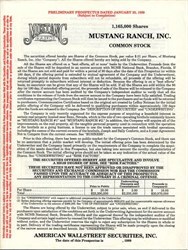 An original stock prospectus from the Mustang Ranch, Inc. , a legal house of prostitution in Nevada. 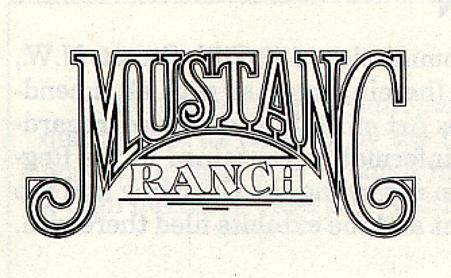 Unfortunately the IPO failed as a result when the U.S. Internal Revenue Service declared that the prostitutes were really employees of the Mustang Ranch, rather than independent contractors, and the Ranch owed a huge amount of payroll tax withholding. As a result, there was a concern about liquidity and the ability of the investors to rise to the occasion so the offering was pulled prematurly. This incredible document has 90 pages of information regarding the Company's Operations, Risk Factors, Pro Forma Financial Statements, Auditors Opinion and much, much more. It discusses the Company's Strategy, Brothel Operations, Business Environment, Government Regulation, and other areas of interest. This is truly a classic that will provide some very entertaining reading.